Most 1/64th scale micro RC cars use transistors in the circuits that drive their motors. Replacing the transistors with MOSFET devices and optionally removing several resistors and rerouting one of the MOSFET gate circuits allows more power to be delivered to the motors. This document deals specificly with the ZipZap SE and provides instructions for identifying the transistors to be replaced for other cars. 8 out of 10. The high difficulty level is due mostly to the fine soldering required and the high potential of permanently disabling the vehicle. Optionally you may use n-channel devices in place of the p-channel. This is for bridging resistors, an optional step. H-bridge Schematic 2nd Generation. Same as above, but with the addition of QD5 to control the base of QD1. 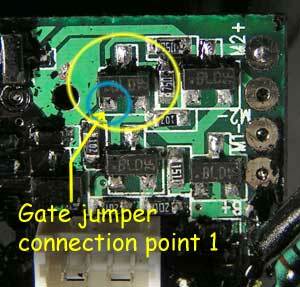 This is the 2nd generation version of the gate jumper mod, it eliminates the need to perform the gate jumper mod. QD5 is found on the top of the board, near the front on the driver side. The primary performance improvement provided by the fet mod is achieved by the replacement of the stock transistors with MOSFET devices. MOSFETs allow more power to be delivered to the motors, which increases both torque and maximum speed of the motors. This, in turn, provides more responsive steering and better acceleration and top speed. There is a total of four resistors that can be modifed to provide a slight performance improvement. RDB1, RDB2, RDB3 and RDB4 are the base resistors for the transistor gates. Their function is to limit the current that flows into the base of each transistor (only a small amount of current is required to saturate, or fully turn on, the transistors. Too much current will damage them. These transistors use a base current of about 1.5mA). Changing them is optional unless the Gate Jumper modification is performed. The gate of a MOSFET (the equivalent of the base of a transistor) does not draw a significant amount of current, so these resistors can be removed and replaced (or simply bridged) with a bit of wire. This allows the MOSFET to turn on slightly faster, and in the case of QD1 and QD2 allows a slightly higher gate voltage. 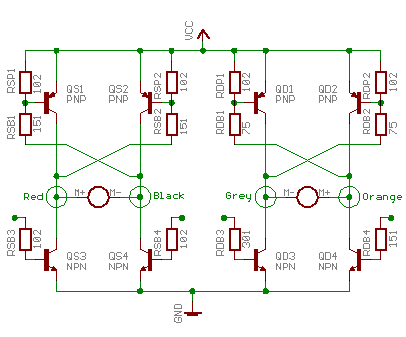 Bridging only resistors RDB3 and RDB4 will have a minimal effect. RDB3 and RDB4 are series resistors in the MOSFET gate circuit and do not have a significant effect on the operation of the MOSFET. It is recommended that RDB3 and RDB4 are left unbridged. Resistors RDB1 and RDB2, in addition to their function as current-limiting base resistors, form a voltage divider with the pullup resistors RDP1 and RDP2. This voltage divider results in a very small reduction of the gate voltage supplied to QD1 and QD2. 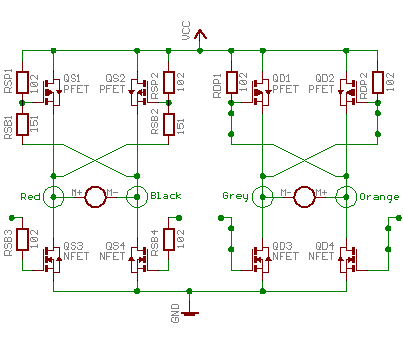 By bridging RDB1 and RDB2 the gate to source voltage (Vgs) can be increased to help the MOSFET process as much power as possible. The voltage divider ratio of 1000:75 means that the maximum increase in gate voltage would be about 7%. I do not currently have performance data from which to make a recomendation on this mod. The generation 1 schematic shown here has had the four transistor base resistors RDB1, RDB2, RDB3 and RDB4 bridged. It is recommended that only the resistors at the top of the diagram, RDB1 and RDB2, be replaced. There is no significant performance gain from replacing RDB2 and RDB3. The transistors have been replaced with MOSFETs. A significant performance improvement can be obtained on first generation SE’s by jumpering the gate of QD3 to the gate of QD1. The base of QD1 is normally pulled down through QD3, but QD3 is already processing a much larger amount of current from the motor, and so it does not provide as much of a pull-down for the QD1 gate as possible. 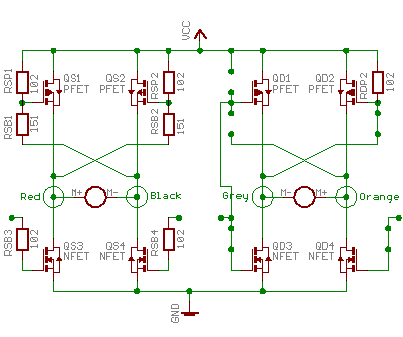 The gate of QD3 is only active when the car is in reverse, so by jumpering the gate of QD1 to the gate of QD3, QD1 can be kept on except when QD3 is on (p-channel devices are on when the gate is how, n-channel are on when the gate is high). This mod requires that RDB1 be removed rather than bridged. Leaving RDB1 connected or bridge may cause damage to the mosfets. After performing the gate jumper mod you will probably notice that the motor will give a little surge of power when the car is first turned on. There is a small delay between power-up and the activation of the car’s CPU, during this time the RDP1 pullup is holding QD1 off and QD3 on, which in turn turns on QD2, allowing current flow to the motor. By removing RDP1 this surge can be eliminated. Since QD1 and QD3 are on opposite sides of the PCB, it is necessary to run a small wire from the front of the board to the back. This can be accomplished by running the wire around the front or side of the board, or a very thin piece of magnet wire (solid copper wire with very thin enamal insulation, usually reddish in color) may be threaded through one of the small holes in the board (these holes are called ‘through plated vias’ and serve to connect traces on one side of the board to traces on the other side). 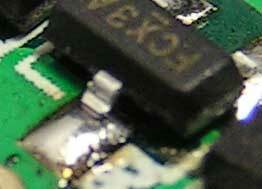 The vias in the PCB are about 30 guage (0.25mm or so in diameter), and frequently have a bit of solder blocking them. 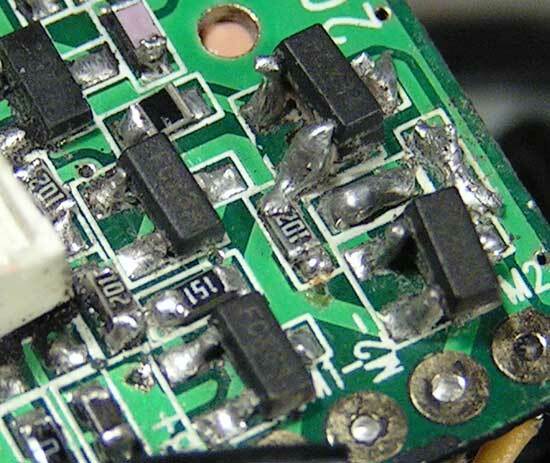 Compressed air or a vacuum desoldering tool will clear them. Desoldering braid my not work well due to the small size, but it can be used to remove most of the solder before using a bit of the magnet wire to clear the hole while the solder is still liquid. Before running the wire through the via it will be necesary to pull the last quarter inch through a piece of very fine sand paper to remove the burrs from the cut end (when clipped the wire is slightly crushed, making it expand sideways to a greater diameter). Thread the wire through the via and cut off the part that sanded portion. Poke the new end into a blob of hot solder on the end of the soldering iron. This should be sufficent to burn off a bit of the enamel insulation and allow for soldering. Do NOT put solder on the via! Use a very small dot of hot glue or epoxy to secure the wire at the via. Epoxy is not recommended because it cannot be removed. If the wire fails the epoxy cannot be removed to make repairs. The generation 1 schematic shown here has had three of the transistor base resistors RDB2, RDB3 and RDB4 bridged. RDB1 has been removed completely and the gate of QD1 has been bridged to QD3. The transistors have been replaced with MOSFETs. The leads to be soldered are very small, so it is essential to have a properly configured soldering iron. If the tip of the iron is not clean and sharp, use a file on the cold iron to produce a pencil-like point. Heat the iron to operating temperature and clean with a wet rag or sponge, then apply enough solder to produce a uniform coating on the tip and again clean the tip on the rag or sponge. The tip should be left with a very thin coat of solder, but no drips. Start by testing the performance of your RC car. If you have an RPM meter measure the unloaded acceleration and top speed of the car. You may also time the car over a fixed distance, or measure the maximum incline the car can climb. Select conditions (track surfaces and distances) that can be replicated for comparison testing. Test with a variety of motors if you like. The MOSFET mod seems to perform best with the Radio Shack NOS motor. This motor is fast, but does not exceed the capacity of the batteries to provide power. Faster motors like the King 4.2 also perform very well, but they demand more current than the stock battery can supply. For best performance with very low resistance motors you will need a higher performance battery. If the top of the PCB is painted black, it will be necessary to remove some of the paint in order to identify and remove components. Use the jewelers screwdriver to carefully flake off the paint as you work. This is a first generation schematic of the components and the connections between them. The two h-shaped sections are called h-bridges, the one on the right is for the drive motor, the left is for the steering motor. The inputs to control the motors are at the unconnected ends of RSB3, RSB4, RDB3 and RDB4. This is a second generation schematic of the SE drive components. Note the inclusion of QD5 near the middle of the diagram. The primary components to be changed are the transistors. On the ZipZap SE PCB half of the transistors (the n-channels) are on the bottom of the board, and half (the p-channels) are on the top. The main drive motor transistors are the four closest to the front of the PCB. The steering motor is controlled by the four transistors located directly to the rear of the drive transistors. 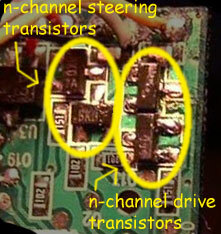 In this image of the bottom of the PCB the n-channel transistors can be seen. The two on the right are the drive transistors. The two on the left are the steering transistors. These will be replaced with n-channel MOSFETs, such as the IRLML2502s. Some ZipZap SE boards come with one of the n-channel drive transistors (the on in the top right-hand corner of this image, QD4 in the illistration above) double-stacked, it will appear to be twice as tall as the other transistors. 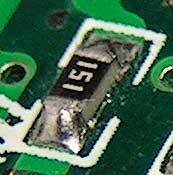 In this image of the top of the PCB the p-channel transistors can be seen. 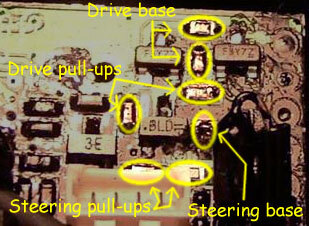 The two at the top (the front of the board when installed in the car) are the drive transistors. The two at the bottom are the steering transistors. Note that the transistor at the lower right is obscured by a black-painted component in this image. This component must be gently bent upward to expose the transistor. These will be replaced with p-channel MOSFETs, such as the IRLML6401s. 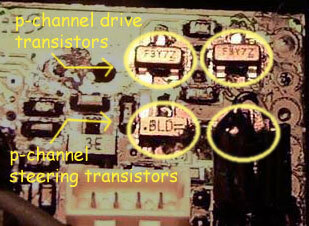 This is an image of the five resistors on bottom of the PCB that are part of the h-bridges. The two resistors on the right, RDB3 and RDB4, can be bridged by replacing it with a bit of wire. This is mostly easily done if the resistor is removed first, but this is not necessary for the bridge to work. If the steering transistors are also replaced with MOSFETs the steering base resistors can also be bridged, but it is unlikely that any performance difference will be apparent. This is an image of the seven resistors on the top of the PCB that are part of the h-bridges. The two resistors at the top of the image, RDB1 and RDB2, should also be bridged, unless the gate jumper mod (see above) is also performed. 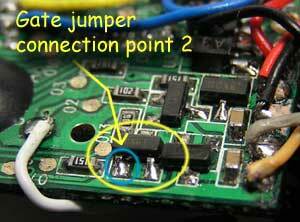 If the gate jumper mod is performed, RDB1 must be removed completely and the pads left unjumpered. As above, if the steering is upgraded to MOSFETs, RSB1, the only steering base resistors on the top, can also be bridged (again unless the gate jumper mod is performed on the steering h-bridge, in which case, remove the appropriate resistor). It is not necessary to modify the pullup resistors. 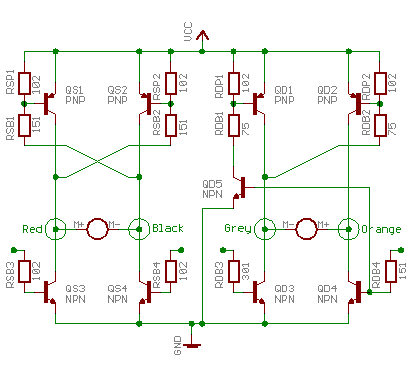 Bridging them will result in a short-circuit when the h-bridge is active, and removing them will leave the MOSFET gates floating, which will probably also result in a short-circuit. The values of the pull-ups can be increased if desired, anything from 3k to 33k would be sufficent. This modification would save a very small amount of power. 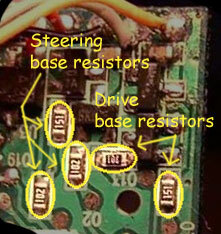 In this image of the top of the PCB, the gate lead of MOSFET QD1 is circled in blue. To perform the gate jumper mod this lead must be connected to the gate lead of MOSFET QD3, seen below. For this mod to work the resistor RDB1 must be removed and left unbridged. In this image of the bottom of the PCB, the gate lead of MOSFET QD3 is circled in blue. Working quickly to avoid unnecessary heating of components, heat one leg of the component and use a small jewelers screwdriver to pry that side of the component up off the PCB. 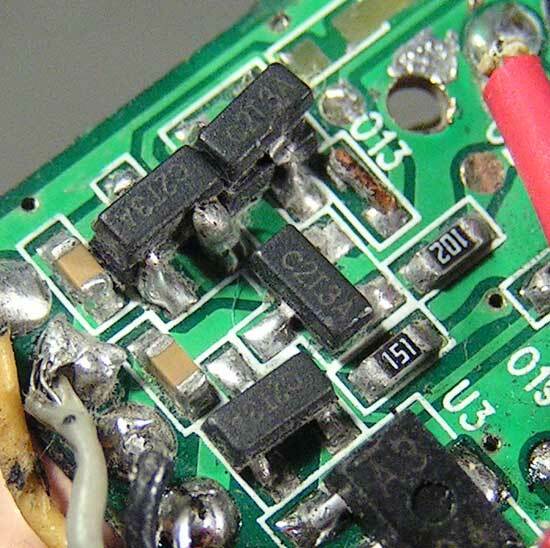 Do not attempt to lift the component until the solder on the leg to be lifted has melted, lifting a component before the solder has melted can tear the copper pad it is connected to up off the PCB, making replacement very difficult. Transisters are usually most easily removed by lifting the side with one leg first. Resistors can usually be heated all at once, freeing both sides at the same time. Frequently they will stick to the tip of the iron. 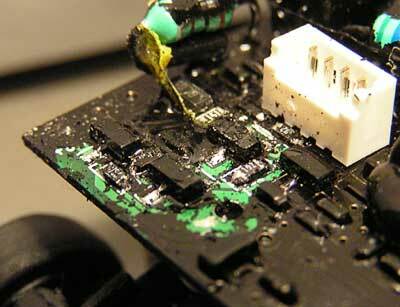 After the components have been removed, touch the soldering iron to the pads to clean up the solder. 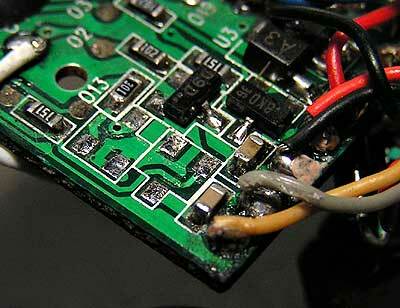 If there is more than a very slight lump of solder, use the desoldering braid to remove the extra. There should be just enough solder to hold down the new components that will be placed there. Here on the top of the board the p-channel transistors for the drive motor have been removed. This is a second generation board, QD5 can be seen at the lower right side of the image. Toward the top of the image the two PNP transistors for the steering motor can be seen. Here on the bottom of the board the n-channel transistors for the drive motor have been removed. Toward the upper right corner of the image the two NPN transistors for the steering motor can be see, just below the component labeled ‘A3’. The NPN transistors on the bottom of the board are to be replaced with the n-channel MOSFETs (IRLML2502), the PNP transistors on the top of the board are to be replaced with p-channel MOSFETS (IRLML6401). 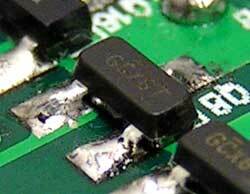 Resistors can be bridged with a bit of wire without removing the resistor if desired. Using a jewelers screwdriver place a small amount of soldering flux on the pads, then place the component on the pads and use the jewelers screwdriver to position it and hold it down. You may also use a bit of contact cement or other adhesive to hold the component in place while soldering. Just be aware that if removal of the component becomes necessary, a permanent adhesive could complicate the operation. Heat one leg of the component to secure it, then proceed to the next leg. If the component is heated excessively allow it to cool a bit before continuing. Place the new component on top of the small lump of solder left on the pads. 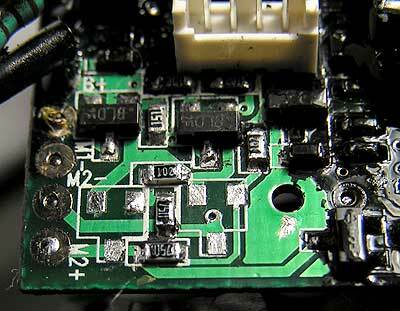 No extra solder should be required when installing the components. This is the top of a finished first generation board with a double stack of p-channel MOSFETs and bridged resistors. This is the bottom of a finished first generation board with a double stack of n-channel MOSFETs and bridged resistors. 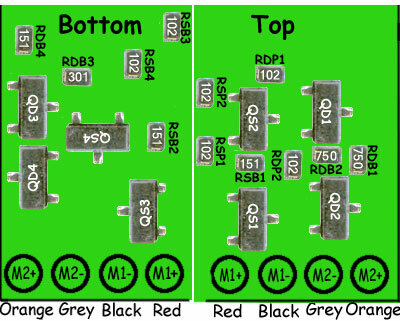 Suitable MOSFETs can be obtained from Digikey (http://www.digikey.com) in the USA as part numbers ‘IRLML2502CT-ND’ and ‘IRLML6401CT-ND’ for about USD0.66 each (plus shipping and USD5 handling for orders under USD25) or from http://www.rs-components.com.au in Australia. Mouser (http://www.mouser.com) also carries a wide range of SOT-23 MOSFETs that will work, but as of the time of this writing Mouser did not carry the IRLML* parts listed in this document. If you do not feel you can safely perform a FET mod on your car, or if you’ve already attempted it and cannot get it working, I can help you out. I offer FET mod service for $20 for one car, or $17 each for multiple cars. You pay shipping to me, I’ll pay shipping back to you. It usually takes about 7 to 10 days for the car to make it through the US mail service in the contigious states. If you would like to take advantage of this service, please contact me via AOL IM or email. Many people have contributed to the information in this document, it would not exist without information from ph2t, cyborgZero, or codeSuidae. This entry was posted on Thursday, March 17th, 2005 at 11:03 pm	and is filed under Electronics, Micro. You can follow any responses to this entry through the RSS 2.0 feed. You can leave a response, or trackback from your own site.